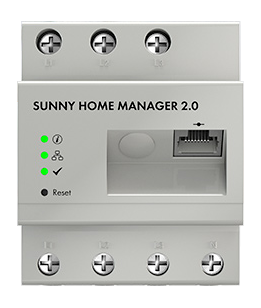 The Sunny Home Manager 2.0 monitors all energy flows in the home, automatically identifies potential savings and facilitates efficient use of solar energy. It makes intelligent energy management even easier and more cost-effective by combining the functions of the Sunny Home Manager and the SMA Energy Meter in a single device starting in April 2017. Related links to "SMA Sunny Home Manager 2.0 SMA HM-20"